THE opening sale of store lambs at Skipton attracted an entry of 4,258 head, 900 more than the previous year, and averaged £61.76 per head, up £3 on 2015. Father and son, Chris and Tom Heseltine, Bolton Abbey, consigned the first prize pen of 40 or more store lambs for the second year in succession. 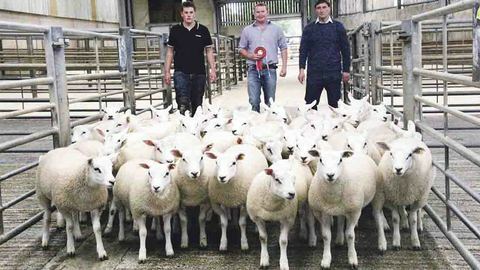 Their pen of 40 Beltex crosses sold for £76/head to Thomas Walmsley, Harrogate. The Heseltine’s’ 118-strong store lamb consignment averaged £71.13/head, the best of the day. The second prize pen of 50 Texel crosses from Roland Carr, Bolton Abbey, sold for £70/head, with the third prize 40-strong Texel-cross pen from Adrian Leach, Hebden Bridge, making £67.40 each. The day’s top call of £79 per head was for a Suffolk cross entry from Swinbank and Briggs, Malham.